Inking on the Edge: SugarPea Designs...May Sweet Sneak Peeks - Day 2...Hello, Sunshine! SugarPea Designs...May Sweet Sneak Peeks - Day 2...Hello, Sunshine! Hello Stampin' friends! Welcome back to the SugarPea Designs Sweet Sneak Peeks - Day 2! 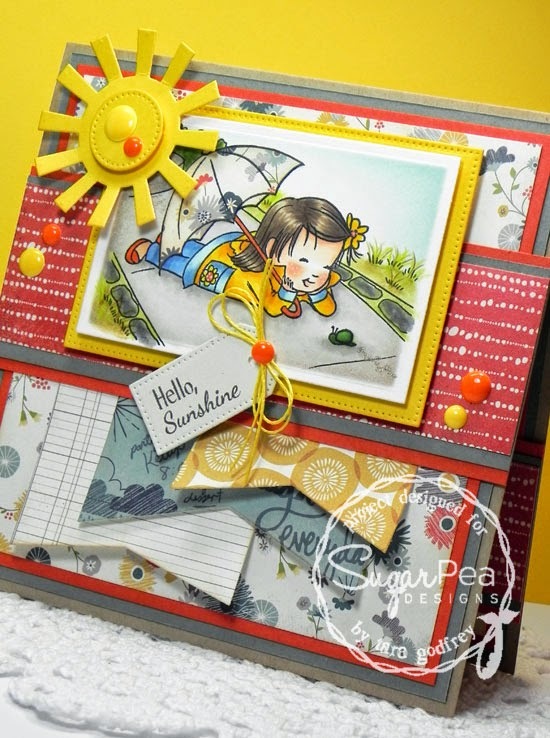 Today I'm sharing a card I made with the NEW Sweet P Collection - Hello, Sunshine! This little girl is the cutest thing ever and she comes with a few little "friends" and such sweet sentiments! Would you like to WIN the Hello, Sunshine stamp set?! Hop along and visit with the SugarPeas and guests, leaving some comment love along the way! One lucky person will be randomly selected to win the Hello, Sunshine stamp set! I made my card 6X6 and used BasicGrey Mon Ami 6X6 paper pad. I coloured up the NEW Hello, Sunshine girl with my Copics and paper pieced her umbrella. I cut the image out with my Rectangle STAX and left the image in the die and inked with Tumbled Glass Distress ink. I stamped the perfect sentiment from this Hello, Sunshine stamp set with Steel Grey Premium Dye ink and cut it out with the Pierced Traditional Tag STAX. I added a few Yellow and Orange Gumdrops. I finished the inside too....I stamped a shadow image in Tangy Orange Premium Dye Ink and another sweet sentiment from the Hello, Sunshine Stamp set. 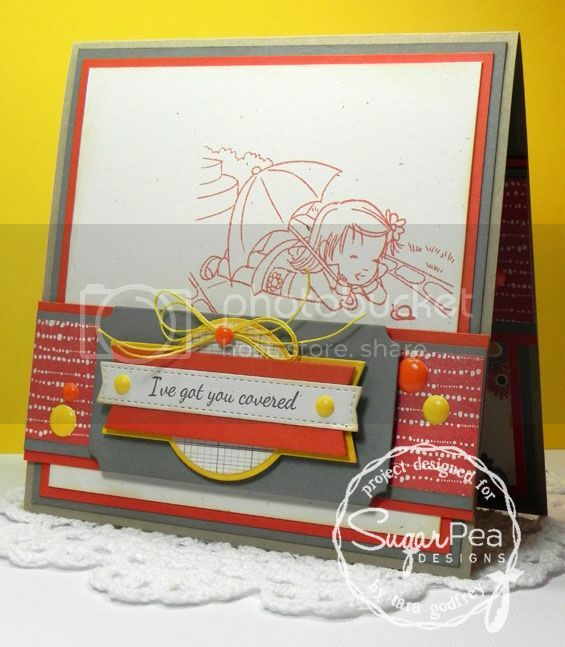 Thanks for stopping by and a little look at my card with the NEW Hello, Sunshine Stamp set for SugarPea Designs! Please hop along to all the SugarPea Designers blogs to see all the sunny creations that they have to share with you! We are paper pad buddies, fun collection right?! This is AMAZING Tara! Wow, such a sweet stamp and card!! Love the coloring! Oh my gosh...your card is beautiful - the layers - oooooH, love! This new little hello sunshine girl is so cute, I am new to your company and so glad I found you! Oh my goodness Tara this is the cutest. A work of art. Look at all those gorgeous layers. Very cute. I like all the layers, paper piecing and the gumdrops. Over the top gorgeous card Tara. Love all the layers and the inside. Love your card-so beautiful! Can't wait for the new release. Wonderful card with such a darling image! fab card, love the inside too! Eeeek!!! Love, love that burst of color on your card Tara! oh, Tara! she's lovley. what a beautiful scene you created. What an adorable image. i just love the way you pulled together all the different patterned papers. Beautiful card! I love all the layers and colors. Thank you for sharing. Love all the layers and paper piecing, very cute!! She is so cute - watching the slug cross the road. Love the inside too. Gorgeous card and beautiful coloring! Love your layout too. This card is simply gorgeous! What an amazing design and I love the grays! Modern elegance! OMGosh she is so adorable, I love the paper peiced umbrella and the cute card design and dp you used. Fabulous. Great card! Such a sweet image. I love your coloring and all the layers. Oh, I love all your paper on this, great job GF! Love this little girl. So cute!! Great card, I love this color combo. Oh, how adorable! I love all the papers you used and this layout is fabulous! And that adorable paper pieced umbrella??? So Cute! Gorgeous card inside and out! I love the way you go all out on the inside too! Cute cute image!